Recent versions of E-Prime display the error below at runtime to prevent you from losing data. 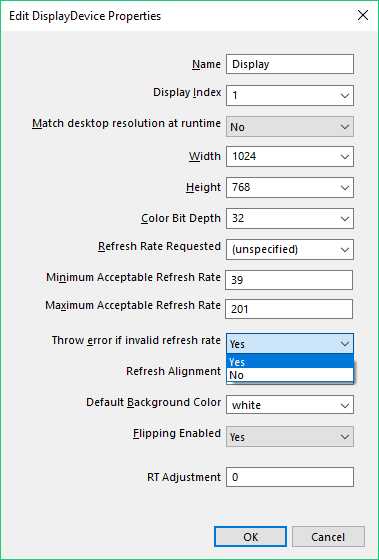 When a display adapter does not accurately report a valid refresh rate, calculations in E-Prime can be misrepresented and cause timing errors. 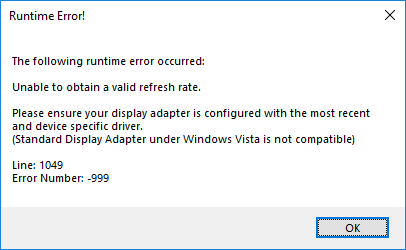 To resolve the problem and prevent the error, please set your computer to use the native driver of the video card instead of the Standard Display Driver. You can try Windows Update or the video card manufacturer's website to find the driver. NOTE: This error often occurs when running on a virtual machine or through virtualization software such as Parallels. E-Prime is supported on native Windows installations only. E-Prime 2.0.10.182+ and E-Prime 3.0 include an option to ignore the error for spot-testing purposes. Open the Experiment Object at the top of the Structure, go to the Devices tab, double-click the Display device, and set the "Throw error if invalid refresh rate" property to No. In E-Prime 2.0.8.90(a), setting the "Match desktop resolution at runtime" property to Yes may resolve the error in some environments. PST recommends this option only for spot-testing purposes. 3/24/2012 19:34 Is it possible to turn off this warning? This error enforces that no development can be done on Vista or virtual machines. It seems rather unnecessary and treats the users like idiots who don't know what they're doing. At least give us an option to turn it into a warning! 9/10/2012 9:08 There should be a toggle for this feature. Many of us develop our scripts on a Mac with software like Parallels and we're now crippled. I would characterize this as shoddy design that shouldn't have to hurt end-users, but does. 9/10/2012 15:23 Check Experiment Object / Devices / Display. There is the ability to change the range and to have or not have an error. This toggle was introduced for the specific reasons above.